You may download and print the registration form here, OR fill out the online form below. I hereby release Tacoma Christian Center from all liabilities should anything arise while I am attending this Conference. I agree that if medical charges should occur, I am fully responsible for all debt. I also authorize the Tacoma Christian Center Men’s Board to make any medical decisions necessary should they be unable to reach my emergency contact and I am not able to make the decision on my own accord. If you need to cancel for ANY REASON, written notice must be received by September 16th, 2018. Cancellations after this date WILL REQUIRE FULL PAYMENT REGARDLESS IF YOU ATTEND OR NOT. 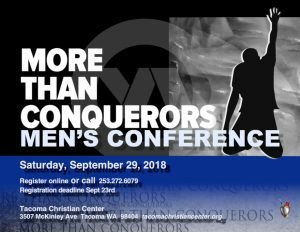 You may pay your registration fee in person at Tacoma Christian Center, or by using the PayPal button below. Please fill out registration form above for each registration below. and are delighted to have you join us !